Action Figures – Issue Six: Power Play and Action Figures – Live Free or Die: Edited, formatted, awaiting front cover art. The Adventures of Strongarm & Lightfoot – Blades of Glory: First draft is underway! I’m off to a good start thanks to a solid writing weekend, and I’m hoping work on this will clip along so I can have it ready for a fall release. 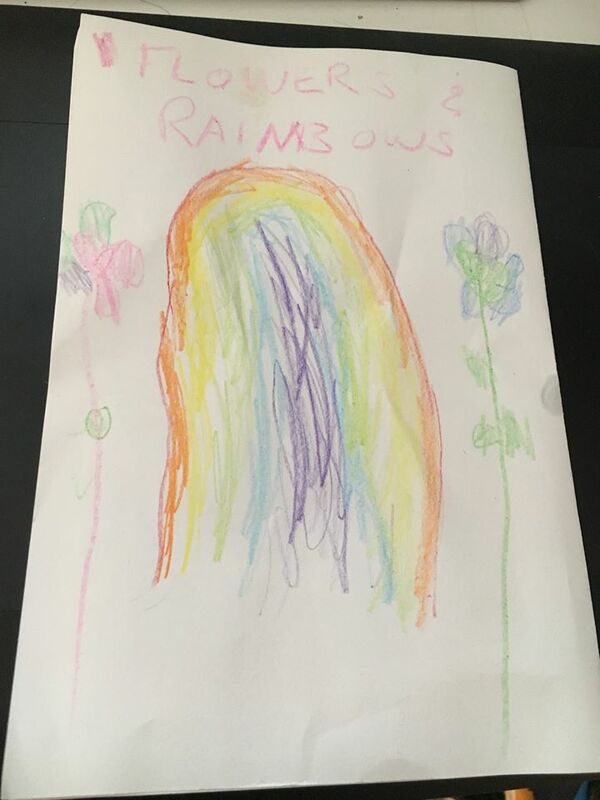 To end on a cute and flattering note, apparently my cover artist Tricia’s daughter has decided she wants to follow in her mother’s footsteps and illustrate book covers, and she drew one that she’s declared is for my next book — which she has also declared will be called Flowers and Rainbows. Lance Flowers is a male model by day, a vampire by night. Allison Rainbows is a down-and-out MMA fighter with a grudge. They’re detectives. Flowers & Rainbows, the plot sounds an like the books my wife loves….